Here is the circuit diagram of a 30V/3A adjustable regulator using the LM723 IC from the National Semiconductors. LM723 is an integrated series regulator whose output voltage can be adjusted between 2V and 37V. The IC by itself can deliver an output current of 150mA and the maximum input voltage to the IC is 40V. Here 3A output current is attained by adding a pass transistor (Q1) to the ICs output. The pass transistor used here is a Darlington transistor MJ3001. The internal reference voltage of the IC is 7.15V and it is available at pin6. POT R1 can be used to adjust the output voltage. T1 can be a 230V primary, 25V secondary, 5A step down transformer. Q1 must be fitted on a proper heat sink. Output voltage can be adjusted by using the POT R1. Pin no 2 & 3 are for current sensesense, it is correct. 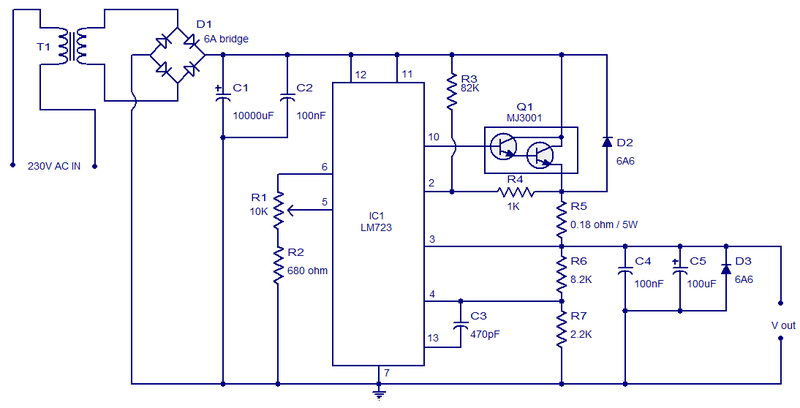 It is possible through limit pin of 723. use the following circuit as your guideline. Anybody got a 30V 2A fix? I guess it will be a couple of components to change? is it okay if i replace MJ3001 with TIP142? it is also darlington, how do you say about it? all other resistors can be 1/4 watt. With the exception of R5, can the rest of the resistors be of a low power rating, say 1/4 W? What is the designation of the 6A6 for the diodes? Are these regular 1n400x diodes?